Dominic Thiem is the Indian Wells Champion for 2019 after producing a powerful display to defeat Roger Federer and claim the biggest title of his career. The Austrian who'd made no secret of the fact he was loving the conditions at the Tennis Gardens came from a set down to eventually triumph 3-6, 6-3, 7-5 in just over two hours and deny Roger his sixth BNP Paribas Open title. Federer won the toss and elected to serve. A hold to thirty got him on the board and he was soon up a break. Swiftly moving up 0-40 courtesy of the drop shot before finally breaking on his fourth break point after Thiem had made deuce. A hold to fifteen consolidated the break before Thiem made it 1-3 thanks to a love hold. The Swiss then held to 30 but Thiem was beginning to find his straps with another love hold for 2-4. Roger then found himself down 15-40 and although he saved the first Thiem broke back with some solid baseline hitting. With momentum seemingly on Thiem's side, Roger needed to regroup quickly and he made a move instantly, moving up 15-40 and although Thiem again made deuce a superb pickup in the forecourt set up another break point which he converted for 5-3. He then served out the set to 30, firing down a timely 126mph ace at fifteen all to take the set, winning 8 out 8 at the net and managing to keep Thiem at arm's length. Into set two and the Austrian was under immediate pressure in game one as Roger pegged him to 30-30. A love hold from the five-time champion meant the pressure was instantly back on and the Swiss soon had a breakpoint at 30-40 with some crisp hitting. Thiem saved it and saved a second en route to a big hold for 2-1. Those missed chances rattled Roger who then played a poor game with two risky serve and volleys behind mediocre second serves. Thiem picked him off to break for 3-1. A love hold put the Austrian up 4-1 and he was able to maintain his advantage to take the set 6-3. With Roger never having won a deciding set in an Indian Wells final the history books were against him as the pair traded back to back holds for 2-2 a piece in the third. The set was relatively uneventful until game seven where Roger fashioned 0-30 but then missed a very makeable forehand would have given him three break points. A breakpoint did come his way at 30-40 but he missed the pass and Thiem escaped to level at 4-4. The Swiss then held to thirty for 5-4 and was again into Thiem's next service game making thirty all. Roger then tried a chip and charge but Thiem delivered a quality pass en route to levelling at 5-5. At 30-15 Roger looked set to guarantee himself at least a tie break but back to back drop shots didn't pay off as Thiem fashioned a break point which he converted to lead 6-5. The Austrian showed signs of nerves when serving out against Raonic but here he was in the zone, delivering some powerful serves and Roger couldn't find anything on the return as he held to fifteen to bag his first Masters 1000 crown. I'm not too disappointed. I feel like he had to come up with the goods, and it did feel like to some extent it was on my racquet. I just came up against somebody who was, on the day, a bit better when it really mattered. That's how it goes. Sure, it's frustrating and disappointing and sad to some extent. But look, I have been in these positions so many times that I get over it very quickly. It's hard to pinpoint exactly what went wrong. The return he hits on the line at 5-all [in the third set], that's the one I needed, and I couldn't produce that. Why is that? You can start looking, digging so deep, and then you end up getting lost, rather than just saying he played maybe a little bit better when he really had to. I didn't feel like I played bad, either. I had my chances. I was in the points. A tough loss here for Roger here and just like last year he lost yet another Indian Wells deciding set final which means he's yet to win one in the Desert. I had a bad feeling this match was going to get away from him midway through the first set and unfortunately that proved correct. That thought was purely from how some of the rallies were playing out (all his best shots/points were coming from reactive play) and you could see Roger was doing just enough to keep Thiem at arm's length. Just enough can often be good enough but in a game of fine margins, any slip-ups or momentum shifts can cost you especially against a guy who can hit through the court with raw power. That's what happened here as Roger had his chances (2/11 on break points) but he didn't take them and allowed Thiem to get on a roll, build momentum then catch fire with some power hitting. Like Roger said in the press conference it's hard to pinpoint the exact reasons for the loss but I think game three in set two was a big one. If Roger goes up 2-1 there then he's established control. Still, no guarantee he'd have maintained the lead as he wasn't dictating from the baseline but there's a chance Thiem goes into his shell when he's down a set and a break. As for the Austrian, as I posted in my quick final preview, he was loving the conditions here and I think that showed, he was able to take huge cuts at the ball and get a lot of action from the gritty surface to really play a solid match. He served smart throughout, never backed off when he had the chance and as he attested to during his on-court interview he was ‘really in the zone'. 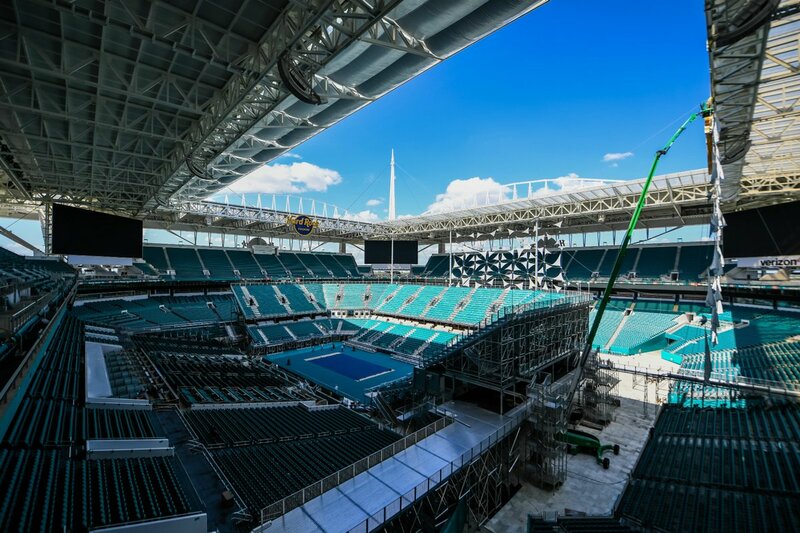 Anway next stop is the Miami Open with its cool new looking courts at the Hard Rock Stadium. The draw comes out later today so stay tuned for my draw preview post. As always, let me know your thoughts on the final in the comments. Cheers. Had chances, could have put the match to bed in the second set but from there he didn't really get on the front foot again and Thiem rightfully landed his first Masters title. I feel more positive than usual after another tough loss. I watched a high level tennis match and enjoyed it a lot. Sure, I’m disappointed not seeing Roger lifting the trophy and losing another title in the clutch. The first set was very sharp from Roger, and in the second, I think you have to give Thiem some credit for mixing his return position just at the right time when Roger couldn’t find a first serve. Thiem’s position enabled him to have a lot of time, take a big swing and dictate the point right from the first return. Caught Roger off guard. Further more, we tend to forget that Roger takes a lot of risks and tries extremely hard shots all the time. Sometimes he just can’t make it. That’s his style and his not changing it even at 37, and IMO that’s what makes him such a great tennis player. As long as he’s keeping such a high level of tennis, I’m happy to watch his matches. I hope he keeps it this way, goes deep in tournaments (not getting kicked by the likes of Kokkinakis), and if he wins some more big tournaments that’s a bonus. Love your analysis. About the risk taking, his style of tennis. Yes, that is why we love his game. I’m so disappointed! He should have one this match even if Thiem played well. It was such a smooth first set that at that point I was sure of victory. Again something happened in the second set and was another story just too many missed opportunities. The third set was Thiem unlashed, credit to him. Nevertheless Roger looks strong, healthy and enjoying his game. Thats what counts. I just feel lucky to watch his game and enjoy his presence in court. Indeed, moving well and playing pretty good. Just needed that killer instinct in the final. 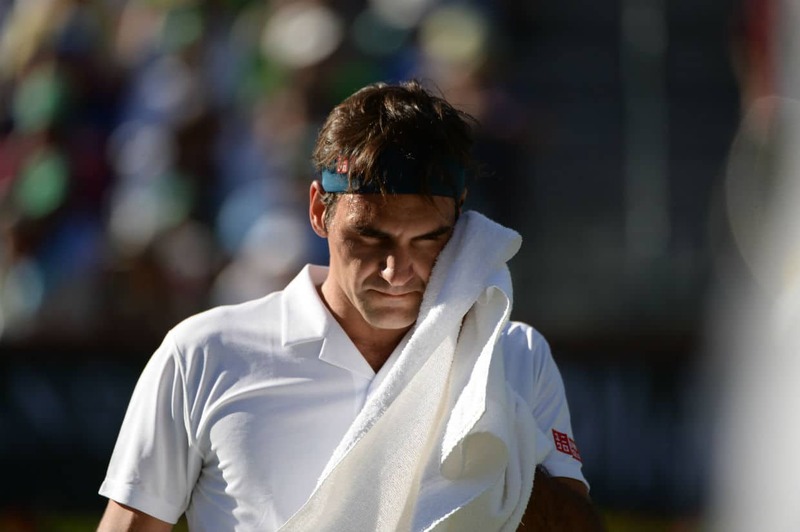 another disappointed for Final set in final round of Indian wells for roger again he made final many time this tournament but always lose in final set 2014 / 2015 ? , 2018 and now 2019 this is another tournament that he can add more than 5or more titles but always miss his chance. may be slow conditions make every serve game can be danger if the ball can return in play he need to be upper hand in rally to control his serve game but after broken in 2nd set he lost control the baseline. Had match point but could not take it, possible too passive or lack confidence when it mattered. I am baffled why Roger choose to execute 3 S&Vs in a row during the 2nd set and then 2 droppers at 5/5 which cost him the match. It was a very poor shot selections which was costly. Sure Thiem played well to save those break points but Roger was way too passive. Not sure if he was feeling tired and sudden drop in form and focus. Hope he sits down with his team and review his thought process. It time to go on offense not waiting for his opponent to make mistakes. Yes, that was the problem. We can’t get mad that Roger didn’t convert on those early BPs in the second set, because the server has a lot to say there, and it’s not like Roger missed a sitter to blow a break. Thiem was in no worse shape on those two points and rightfully held, just like Fed has saved countless break points in his career in big game. The problem was he now has this almost certain (before, it was occasional, albeit on big stages, like the 2011 USO semi) letdown after a game where he felt he should’ve broken, when he plays too brazenly, too “angrily” on his next service game. That’s what happened in set two and it resulted in a break. In set three, same thing. Yes, he had 0-30, yes, he did miss a makeable forehand, but at 30-40, he didn’t deserve to win that break point any more than Thiem did. Instead of holding, he played risky and low IQ shots next game, hitting drop shots against a younger and motivated opponent, and donating the game as a result. If he lost in the TB, I’d think nothing of it, but to give yourself no chance from what was a fine situation, that really rankles. This whole loss really pisses me off, because despite the conditions, Thiem was beatable here, and Roger undercut himself. I hope he avenges this somewhere else this year. Yeah that game was a let down after missing the breakpoint. Was still mentally in the last game. second set it added fuel to DT and from then on he looked good. to the winner I enjoyed the match nice to see another name in the mix. Jonathan, I think this would have been Roger’s sixth IW title, your first para mentions his fifth if victorious. It’s fascinating that you and I had the same feeling in set 1 that he might run into trouble. I had to run to a meeting and came back at the end of set 3 and wasn’t surprised. For Theim, looks like he earned it today. Yeah thanks, the post was littered with mistakes 😀 I was trying to fix the site whilst writing it as it wouldn’t load. Well yes, disappointed because we all hoped he’d win this one (having never lost on hard court to Thiem). But this court was slow enough to suit Thiem to a T. Plus, that break-point conversion failure (2/11) rankles, as does the poor choice of shots in crucial moments. The BP thing is like a stubborn ghost, haunting a lot of Fed’s losses since some years now (2015 USO?). Anyway, all said and done, Roger’s press conference put it into perspective. Yes, it’s frustrating and disappointing, but he’s been in too many matches like this for the negatives to linger. He’s moved on. Besides, he seems to genuinely like youngsters like Thiem, Zverev and Tsitsipas winning big tournaments/matches. So do I.
Btw, just a thought. Doesn’t Thiem seem to put in a huge amount of effort in almost every shot? I get exhausted just looking at him. He’s young now, so it’s fine, but can he sustain this kind of all-out power when he’s older? Anyway, I hope he wins a few FOs before he runs out of gas, starting this year! Yes, he does. He takes a loooong tyyyyyyyyyyring take baaaack. And hooooolds his breatheeeee and coooooils like a spriiingggg and booooommm unfoooolds and craaaaaaacks the baaallll. Sorry to appear here again (I know most of you don’t like it). Nice you care so much about Thiem’s fitness and longevity 😉 But let me tell you (I’m kind of insider here), you don’t understand Thiem’s hitting technique. First what could eventually fit your description, was long ago. If you did watch the IW final, you may have noticed, how often Thiem hits with very short backsdwing, almost half-volley. Then – some here say about “raw power”. Another m misunderstanding. Thiem is not physically strong (in terms of muscles mass – Roger has a lot ,ore, not to speak about Rafa). Look his arms and legs and calves. Most of today’s “tennis girls” would like to have such legs, when going to dance or something. Where should this “raw power” come from, when the muscle mass is not present? It comes from a special hitting technique , where the racket is not an extension of the arm, but of the whole body. It looks like big effort, but it isn’t. BTW the ball has no POWER but only SPEED (plus spin, direction a.s.o.) Thiem does not use much arm power, but high speed of the hand, when hitting. For this he needed over years this “veeeryyy looooong” backswing. He does not need it anymore. For Thiem (I know this since years but I also read recently an article on ATP website telling the same. For Thiem the racket is not an extension of the arm, but of the whole body. Just like every player makes his body a spring to generate more speed and this starts from feet and bending of knees and ends with jumping high and making a loop with the racket). Thiem replicates this movement section on every shot (dropshots excluded). You may laugh so much you want about Thiem and Bresnik (BTW – on the tour it’s now Nicolas Massú). And your parody of Thiem’s English pronunciation tells more about you than about Thiem. On the end – ypour are close to say, Thiem must dope heavier than Nadal, because at least Nadal has big muscle (=raw power) , if he can play this kind of tennis against Nadal (for example US Open 2018) almost 5 hours long and looks fresh like he could play another 5, while Rafa is done and must pause more than 3 month. Thiem’s hitting technique (yes, invented and teached by the man wearing straw hut)) will allow Thiem to experience longevity (if nothing else happens). Thiem had so far only accidental injuries (after fall or similar) and is not in danger of having knee problems like Nadal. Just like Roger’s game looks effortless while it is not, Thiem’s game looks effort-full, while it is not. BTW – Federer did play great yesterday, given he was forced to play lots of long baseline rallies. Some pf you reclaim his low breakpoint conversion factor. Another misunderstanding. In every rally there are always two parts. One serves – the other returns. If the return is good, means the serve was poor??? How often Federer saves lots of breaks, including holding serve from 0:40? Consequently the other will have low breakpoint conversion ratio. But he did play Federer. That’s why he could not convert. Not Federer’s returns on break-points were poor, but Thiem’s serve when trailing was good. Take it serious and think about or continue your parody. I will not follow this thread. it’s for your information only. Interesting comment and I agree with bits of it but you are getting too caught up in semantics with the raw power stuff. Thiem was hitting groundstrokes at 95mph consistently, that is raw power regardless of how you want to define it. Lol! You mimicked him so well! I still find him very likeable though, not arrogant at all like some other young kids. Isn’t his grunting worse than Rafa? Well, there is no “should have won” or “shouldn’t have lost” in sports (and in most other activities for that matter). Matches are not won by status, trophies, statistics, good looks, bad arsness, etc, etc, etc. Matches are won on court by technique, tactics, physical and mental strenght, a bit of luck here and there, all added up during the time that the match takes and that’s it. What happened yesterday was something that may seem strange to some: one of the players played better than the other and deserved the win 100%, fair and square. It just happens that the former was not Roger. Sure enough, we can analyze it deep and even deeper, but in my view that is not our job (I’m not saying it’s forbidden) and at times it feels a bit masochistic. I know jack$hit about tennis when compared to Roger and I’m completely sure that he did all the analyses that really matter to him. So?… Let’s move on. Miami next. Like I say many times, save you anger and bitterness for the really nasty stuff that deserves it. This is sport, for peanut’s sake. To me, it seemed like Roger just wasn’t making enough backhands in the crucial moments. A couple fewer unforced errors particularly on that side here and there and he would’ve won the match. But I shared Jonathan’s feeling from watching the first set early on that it looked like Roger was going to be in trouble in this match. Still, shame that he wasn’t able to produce his best play when it counted, but what can you do. Yeah, Thiem hit 73% of serves in the ad court into his backhand. Peppered that win in the rallies too. How many male pro tennis players are playing at age 37……….ummmmmmmmmmmmmmmmmm just one. Please people enjoy that Roger is still playing and is still winning. He won number 100 and I really think he is playing and enjoying himself more than ever. He also picked up a huge second place check that allows his wife to go crazy in Miami today. Merka go crazy and buy an ocean front home in Miami and enjoy life while others are upset that your husband didn’t win Indian Wells. And Dominic there is no reason you should not dominate clay court this year. Great comments here everyone. And thanks for the post, Jonathan. I suppose for me, the troubling part is my lack of confidence in his game these days. When his serve, bp chances, focus, assertive play, decision making takes a walkabout in the outback, it’s tough to watch. We all know what he is capable of doing and sad when it falls away into another loss. Logically, I think, move on, but emotionally it takes awhile to grieve the loss. Can’t help it. those who play a defensive game and slog away from the back of the court.As someone said’no one has died here’ so things do need to be kept in proportion. Fed played a good match and lost narrowly to a young man at the height of his physical prowess on a court that suited his style of play.I don’t think thats too bad and neither did Fed judging by his comments later. can build on this momentum and achieve success where it really counts,at the slams. Perhaps this will be the year that one of the young ones finally breaks through and wins a slam.I sincerely hope so. Good comments. It’s either a pure act, or Federer takes this all very well ( I think he really means it ). I don’t mind him losing, I just hate losing in 3rd set getting broken in the 11th game when he had been holding pretty comfortably beforehand. DT had FOUR breakpoints to ELEVEN for Fed…and yet we’re talking about how DT was dictating the points. That’s the crazy thing, even when Federer is playing reactive tennis, he clearly had chances to win. Poor shot selection on key moments. YOu would have though Thiem was tired out from 3 sets vs Raonic so the dropshots would work, but the guy hits 2 winners on them. The fact is Fed didn’t think the conventional play, hitting a good forehand into the corner, would work. Oh yes at 0 30 on Thiem’s serve in the 3rd set, great point Joanathan, Federer charged the net and THeirem passed him. Had he missed I think Federer breaks and wins. Thiem came up with the goods. Got overpowered by someone who played the important points better than Roger for the second year in a row which is frustrating. These things happen and as Roger gets older, he does get overpowered more easily and frequently. I’m glad just watching his interview which helped getting over the disappointment. That fact that he feels in good health and ready to practice for Miami is good enough. He is not having back problems and taking a break. That by itself if good news and hopefully things will go his way more in Miami and some clay tournaments. If he wins Wimbledon and doesn’t win another title the rest of the year, we should all be thrilled. Even if we want him to, we cannot expect him to win every tournament he enters. Not even in his prime. Recall that, when Fed plays Madrid. There is still lots of differences between slow hard court and fast clay court. Fast or slow is not telling everything. You cannot slide even on very slow hard court, but you can on fastest clay court. Tell Novak you can’t slide on a hard court. Thanks for the great write-ups throughout the tourney despite the time difference, Jonathan. Keep at your fine job for Miami, too. I think I’ve lost count of the matches Roger has lost from the front. When his opponent comes after him his game disappears, he is reeled in, and in a splutter of poor shots and errors he is disposed of. In such situations, it’s hard to recall the player he used to be. The poor break-point conversion rates usually explain everything. It is typically a litany of missed opportunities. Thiem made 3 of 4 break points, while Roger converted a measly 2 of 11. It was almost the Australian Open all over again. His talents are now increasingly at the mercy of the mental side of his game. He has forgotten how to be clutch. 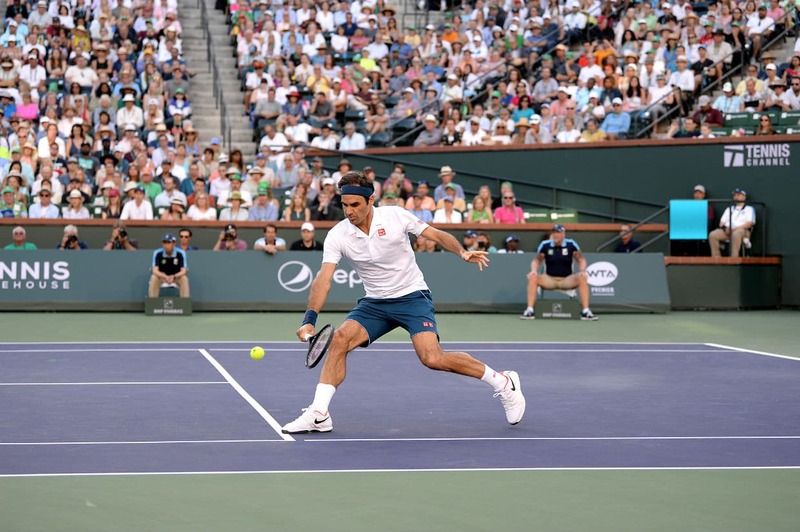 Once again, in Indian Wells, his Achilles heel was starkly exposed. younger opponents.Even now at any tournament you simply cannot count him out. style of tennis.It will be a sad day when he retires and I hope very much that we are not there yet. The truism for politics is that they all start their careers as failures. Oh wow Wanda, SO nice! In my fed Collection at once. Thanks, Wanda! Oh well,we have all had our say,on the whole,kind .intelligent thoughtful. Yeah I didn’t really mention the backhand in my post but it did make quite a few errors. I like that he tried to take it on though, so not sure it’s back to the drawing board as Craig says. If one or two more come had come off then it’s suddenly been a fantastic backhand day. Yes ,Thiem sure was targeting that backhand,unfortunately rather reminiscent of someone else,but at the end of the day they play to win ,fair enough. Let’s see how His single handler holds up against Djoker and Nadal. I don’t understand German well at all but like Dutch!? You need to start watching live! “Needs to shorten those points – what’s he doing getting into long rallies with Domi, especially BH to BH? Backhand looking vulnerable, and Domi seems to be attacking it. What’s with these love holds? Oh well, he’s won the first set. What about those missed break points? Now wait for the wobble when he loses serve and – oh yes, there we are 🙁 Hmm, lots of errors on the backhand again … No, Roger, don’t go all out to break him now, leave it for the tiebreak, unless you want to lose the match. Hah! Didn’t manage to break him after all that effort, and we know what’s going to happen next, don’t we? Yup, broken 🙁 Game, set & match.” He is getting rather predictable.